About Clash Royale game | Clash Royale fan-site! Clash Royale – Mega popular mobile game of the RTS genre (“Real Time Strategy”) from the company SuperCell, which was released “02” March 2016. The whole gameplay build around online battle of two (or four) players against each other, which they conduct with the help of special cards on the special arenas. Note: Cards, after player move them onto arena turn into a characters that are painted on them. These characters are the troops, which immediately goes into a battle after getting on arena. 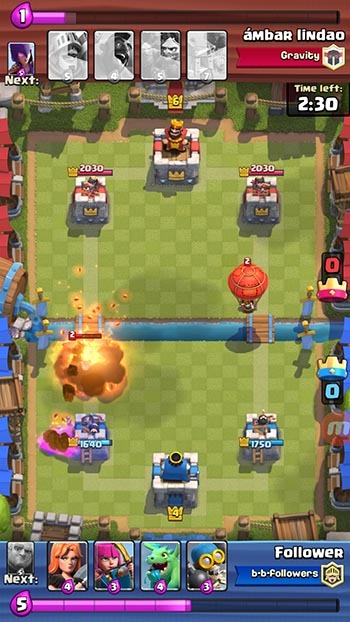 A player wins in case when he destroy three opponent’s towers or destroy more towers than opponent for limited time of the battle. For each victory, players get special trophies, which summed and determine on what Arena the player would be fight. However, if the player lost battle, the number of trophies reduces. Players in Clash Royale can unite in clans, where they can talk, exchange cards and take part in Clan Battles event (battle 2 on 2)! As of 08.06.2017 there are following game modes are available in Clash Royale: Battle, Tournament, Challenge and Clan Battle. Legendary cards (the most rare group) – 12 different cards. The devs all the time introduce new cards into the Game. Players get the cards from the chests, which they can get as a reward for regular playing or as a reward for the victories. It’s worth to noting that not all the cards are available from the start of the game. What cards the player can use depends on what arena he fight. The higher level of arena is – the more different cards are available. All cards has levels that are upgradable. For each upgrade the player need to gather required quantity of the same cards and have enough amount of gold. After a player collected more than 4,000 trophies, he will be promoted to the League. 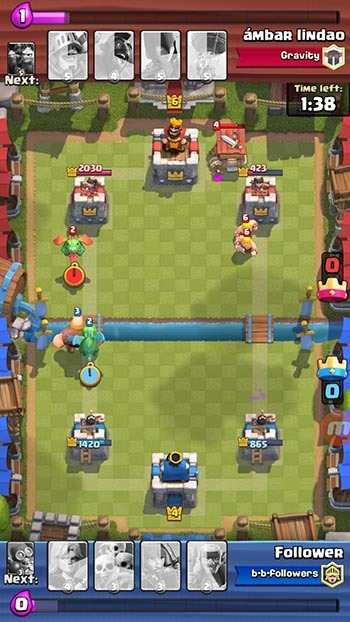 Matchmaking system in Clash Royale based on count of trophies. Thus if the quantity of player’s trophies, for example, is 1400 – the system will choice a rival for him with almost the same quantity of trophies. In Clan Battles or Friendly Challenge, the players will be leveled by the raising the level of cards to approximately the same level. There are two main currencies in Clash Royale: Gold and Gems. Gold needed for cards upgrading. Gems is more universal currency because for gems players can buy gold and chests with cards. This was a brief review of Clash Royal. P.S. If you still not play this game and came on this page accidentally, I strongly recommend you to start play it! Believe me you will like it! P.S.S. Download the Game you can on the AppStore or Play Market.